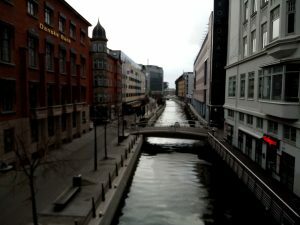 When the UEFA Nations League draw pitted Ireland against Denmark again, I wasn’t too keen on going, not when I had been to Copenhagen just 12 months ago. But the Danish FA decided to stage the game in Aarhus. And so off I went to Denmark’s second city for the last Ireland away trip of 2018. From the tiny airport it’s a dark 50 minute bus ride through pitch-black countryside to Aarhus train station in the city centre. A two minute walk around the corner later and I am at my hotel, The Wakeup Aarhus (the city’s name lends itself to so many puns). The rooms are all white minimalist Scandi design, but with hidden sockets and a quilt too small for the bed. 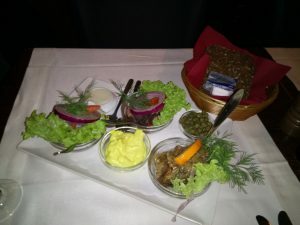 It’s now 7pm and I hadn’t eaten all day, so it was straight out to dinner with Davy at Raadhuus Kafeen, a traditional Danish restaurant less than 10 minutes away. It was packed out, but Davy managed to nab a table prior to my arrival. I hadn’t seen him since Dublin last month so it was great to finally catch up. But it was a mistake to have a starter of three kinds of herring with onions, capers, curry mayonnaise and rye bread, which turned out to be a meal in itself. The main course of the house special, the Raadhuus casserole – tender beef and Frankfurter sausages in paprika sauce with rice – was magnificent but MASSIVE portions. Monday morning and after a bland hotel breakfast (just varieties of bread and cold meats, boiled eggs was as adventurous as it got) it was out to explore the city on foot. Aarhus is located on the east coast of the Jutland peninsula, in the geographical centre of Denmark and has a population of about 270,000. The locals seemed chilled and easy going, and with none of that chip-on-their-shoulder attitude you’d find in citizens of second cities like Cork or Marseille. Everyone seems to cycle here, even though it’s quite hill. Aarhus has the busiest bicycle traffic of any place I’ve visited save Amsterdam. Nonetheless it’s a walkable town, providing you have wrapped up against the elements and prepared to withstand wind chill temperatures of about minus three degrees. It began to rain by late morning, so I took refuge and warmed up in amongst the impressive desert and jungle greenhouses of the Botanical Gardens. Met up with Patrick and his university chum Dave for lunch at the Aarhus Street Food Market. 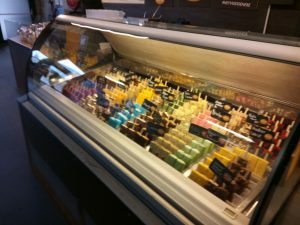 An overwhelming choice of hip artisan foods were to be found at this converted warehouse. I plumped for some tartletters (pastry shells filled with chicken, asparagus and parsley in a cream sauce, superb) followed by a pulled duck burger with a mango sorbet ice lolly for afters. All scoffed down in the convivial company of Irish and Danish fans happily mixing in the communal dining benches. Afterwards, we braved the strong winds across town to Den Gamle By (The Old Town) an open air museum recreating life during different eras in Danish history from 1625 to 1974. All were fascinating to see, but the museums in the museum – facsimiles of museums at the time – were maybe a tad too meta. Darkness had fallen by the time we made it to the rooftop restaurant of the Salling department store. 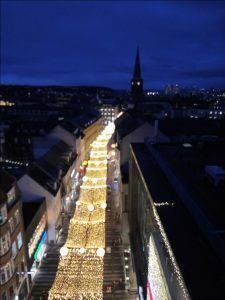 All the better to look down onto the pedestrian Søndergade shopping street all lit up with early Christmas lights. Not even December yet but the Christmas spirit is very much in evidence here. At Patrick’s insistence, I was back at Raadhuus Kafeen for dinner. Having learnt from previous experience, I only had an asparagus soup starter and I was right to do so. It came with enough meatballs and bread to serve as a main meal. On my recommendation Patrick went for the Raadhuus casserole like me yesterday, and like me yesterday, he couldn’t finish it. From here, we walked 30 minutes south through seemingly deserted streets to the Denmark vs. Ireland match at Ceres Park, a functional 18,000 capacity stadium with a running track. The ground was about three-quarters full and the away end was far from filled, so you could sit anywhere. A mini-gale was blowing so we sought shelter in the covered top tier of the stand. Less said about the match the better, suffice to say this was possibly the poorest game I’ve ever attended. Ireland have been on a downward spiral since last year and if nothing changes the future looks desolate. At the end of the dire 0-0 draw, we ambled back into town to Peter Gift, a Danish bar that was staying open late and which just happens to be across from our hotel. It was coming up to 11pm and the regulars were leaving just as we walked in. So we nabbed seats by the fire for a bit of post-match hygge (Danish cosiness, it’s a thing now). Half an hour later, the place was packed with Irish fans and outnumbering their Danish counterparts by 10 to 1. The craic was good, but contemplative, reflective of the bleak prospects ahead for Ireland unless drastic transformations occur. Tuesday morning, it was time for a bit of culture. 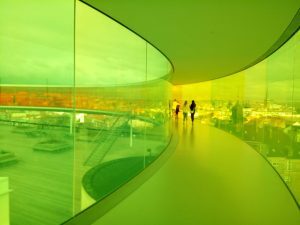 ARoS Aarhus Kunstmuseum, one of Europe’s most innovative art museums, was the obvious place to go. And clearly the thing to see first is Your Rainbow Panorama, a circular 150m long walkway of glass in all the colours of the spectrum situated on top of the museum. Created by Danish-Icelandic artist Olafur Eliasson, it’s supposed to erase the boundary between inside and outside, creating uncertainty as to whether you have stepped into a work of art or into part of the museum. Me? I simply thought it was a great panoramic view of Aarhus seen through a prism of rainbow colours. Also on at ARoS was a Julian Schnabel exhibition. Opinion is still divided on Schnabel as to whether he is the boundary-pushing successor to Jackson Pollock or a pompous chancer beloved by pseuds who think you’re a philistine if you don’t ‘get’ him. I’m firmly in the latter camp, but even I will admit Schnabel’s Rose Paintings series – smashed plates and crockery mounted onto boards and painted to look like roses and shrubbery – are ingenious works of 3-D art. Afterwards, there’s a bit of quick shopping and an artisanal Danish burger (pretentiously served in a fryer basket) before a final Tuborg Christmas beer back at The Old Irish Pub, where I give them an RISSC London scarf to add to the memorabilia hanging on their walls. And with that, my Aarhus trip was over. So there you have it. Aarhus turned out to be what a typical Ireland away trip is lately; a great time exploring a new city, sampling new foods, meeting up with old friends and marred only by a poor performance from the Irish team we’ve journeyed to support. 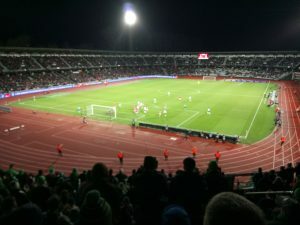 Worryingly this has now become the norm and a huge upheaval is required – both on and off the pitch – if Ireland are to avoid the indignity of not playing in the Euro 2020 tournament which they are part hosting. A year of uncertainty awaits.